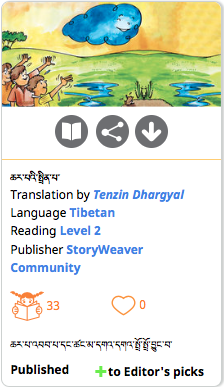 If you've noticed a spate of translations to Tibetan on StoryWeaver recently, then you can give the credit to Tenzin Dhargyal. An English teacher at TCV School, Suja, Himachal Pradesh, Tenzin came across StoryWeaver while browsing through Facebook. He reached out to us and asked if we could add Tibetan to the platform so that he could translate and create stories for students. "I am translating these books so that I can inspire other Tibetan teachers to translate children’s stories to the language. There is a real dearth of good quality stories for kids in Tibetan. "says Tenzin. Tenzin Dhargyal, English Teacher, TCV School, Suja, Himachal Pradesh. Tenzin has been working with children for a long time now and felt that while his students had many books to choose from in English, there just wasn't enough choice when it came to Tibetan. The Tibetan Children’s Village school is a charitable institution with classes from Kindergarten to Standard XII. Tenzin has already shared stories with some of the children online and has plans to download, print and share copies of the stories with his colleagues for them to use in the classroom. "Storyweaver can be very helpful indeed! 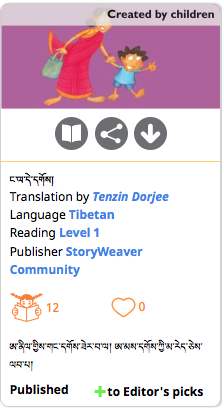 Students can read and get motivated to translate some short, level 1 stories to Tibetan language. This can be also an activity for them. Our teachers can translate some of the stories in Tibetan and use them in class. In fact, some of them have already done this." shares the enthusiastic teacher. Tenzin reached out to other teachers through a Facebook group he is a part of with links to StoryWeaver and requested them to use the platform for translation. They all answered his call and responded, and Tenzin is confident that others will follow suit. 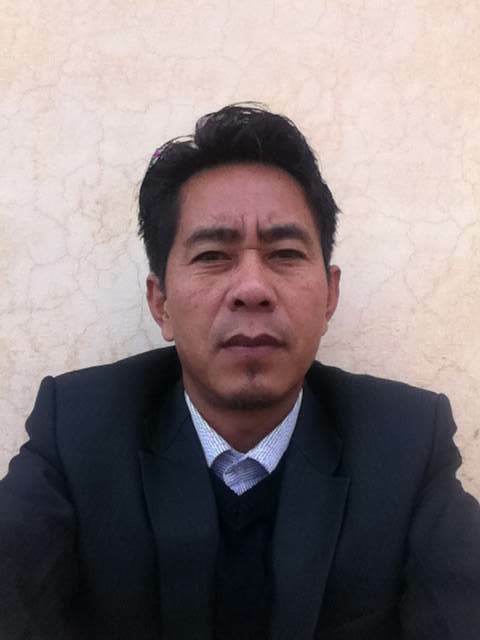 Mr. Tenzin Dorjee la, the Principal of a Tibetan school in Dharamsala and his children have translated two stories and Dr. Chok who works in the Library of Tibetan Works and Archives in Dharamsala and Jigme Wangden la who teaches Tibetan at TCV School have all been active on StoryWeaver. You can read all the Tibetan translations by Tenzin and his colleagues here. "All children are equal, they are the future owners of this planet." says Tenzin "Lets make them good human beings through the morals from these stories we tell." If you would like to translate or create stories on StoryWeaver and can't find your language of choice, write to us at storyweaver@prathambooks.org with your request. Here's to spreading the joy of reading to more children in as many languages as possible.